Today marks the 50th anniversary of Norman Dorsen’s argument of In re Gault 387 U.S. 1 (1967) before the Supreme Court. In recognition of the anniversary, the NEJL, in collaboration with the National Juvenile Defender Center, has recently digitized the original In re Gault case file using the Innovation Hub facility at the National Archives. The entire file will be available online at NARA’s website by February of 2017, and the scans can also be requested from the NEJL archivist. This entry was posted in Defender materials, General, In re Gault anniversary, Research on December 6, 2016 by Katharina Hering. In the aftermath of the elections, reflecting about legal services history has become particularly meaningful. In his remarks at the NLADA Civil Caucus meeting on November 10th, two days after the elections, Don Saunders, NLADA’s Vice President of Civil Legal Services, reminded the audience that the legal services community has successfully managed to sustain programs and the existence of federal funding through challenges by the Nixon and Reagan administrations, as well as by the 104th Congress. 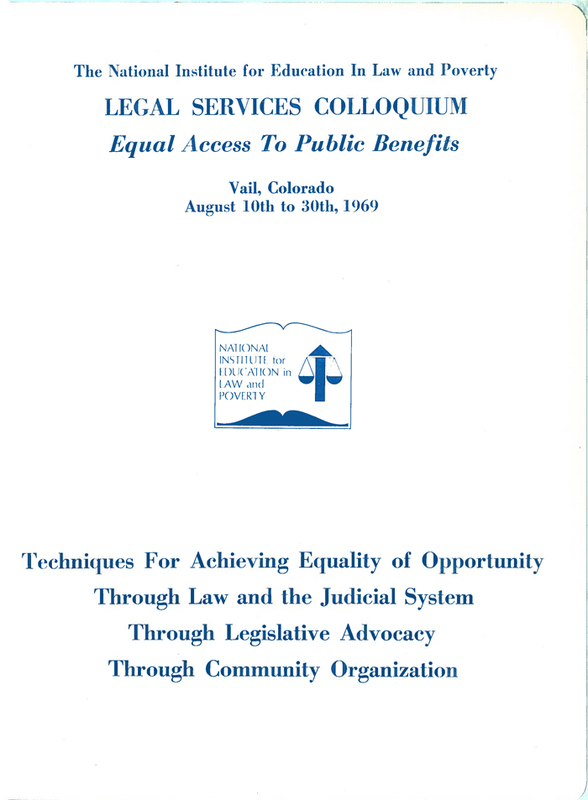 Like no other repository in the United States, the NEJL collections document the continuity and transformations of the legal services movement during these challenges. Numerous legal services programs have been celebrating their 50thanniversaries in the past two years, such as the Neighborhood Legal Services Program in Washington, DC, Community Legal Services of Philadelphia, and California Rural Legal Assistance, or are planning celebrations soon, such as Legal Services of New Jersey. In the past five decades, all these programs have adopted different strategies to maintain, develop and grow their equal justice legal work, despite these challenges. The history of the CRLA, in particular, reflects this persistence. In recognition of the 50th anniversary of the CRLA this year and to share these stories of the past with a wider audience, the NEJL has made available streaming video files of our oral history interviews with Michael Bennett, who was CRLA’s first Administrator, and Cruz Reynoso, who became CRLA’s deputy director in 1968 and a few months later its director. These streaming files complement our existing collection of oral history interviews that are already online, several of which also cover the early history of the CRLA, especially the interview with Gary Bellow. Whether to provide comfort, inspiration, or simply information, listening to these interviews in whole or in part offers welcome moments for reflection during difficult times. Michael Bennett and Cruz Reynoso. “California Rural Legal Assistance (CRLA): Survival of a Poverty Law Practice.” Chicano Law Review, vol. 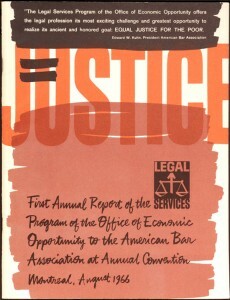 1, issue 1, 1972, pp. 1-78. This entry was posted in Future of Legal Services, General, History of Legal Services, LSC anniversary, Oral history interviews, Research, War on Poverty anniversary on November 21, 2016 by Katharina Hering. 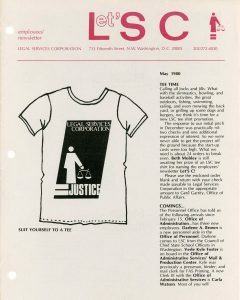 Let’s C — LSC employees’ newsletter, May 1980. LSC Records, Newsletters series, NEJL. The NEJl has recently expanded its finding aid for the LSC records (NEJL 012). The Legal Services Corporation Records constitute one of the core collections of the NEJL, and came to the NEJL in several different accessions. Many of the materials were donated from LSC’s in-house library. The collection consists mostly of gray literature – generally defined as publications that are not controlled by commercial publishers, such as research reports and proceedings of board meetings, and of audio-visual materials. The LSC collection is not a traditional manuscript collection and is partially “artificial”: to fill gaps in specific series and to facilitate easier access to LSC materials, materials from other NEJL collections are included in the LSC finding aid, even though they remain part of other NEJL collections, such as the Bill McCalpin Papers. The records are arranged into the following nine series: 1. Board and committee meetings; 2. Fact books; 3. Budget and appropriation requests; 4. Annual reports; 5. Program directories; 6. Reports and proceedings; 7. training materials, 8. Newsletters and clipping files, and 9. Audio-visual materials. This entry was posted in General, History of Legal Services, LSC anniversary, Research on October 28, 2016 by Katharina Hering. When reviewing correspondence files from the early 1990s, the NEJL archivist recently discovered an unpublished manuscript: Experiences of a Legal Aid Lawyer by Junius L. Allison [ca. 1993]. Allison (1909-2003), who was originally from North Carolina, worked at Chicago’s Legal Aid Bureau in the 1940s and joined NLADA’s staff in 1953. From 1962-1971, he served as the organization’s Executive Director. Allison’s manuscript includes detailed recollections of his work for the Chicago Legal Aid Bureau in the 1940s, and his work for the NLADA in the 1950s and 1960s, where he closely cooperated with Emery A. Brownell. From an archivist’s perspective, Allison’s memoirs are also interesting, because they include descriptions of the contents of NLADA’s library in the 1950s and 1960s, as well as descriptions of some of NLADA’s promotional projects, such as the launch of the “Justice” TV series in 1953. The manuscript can be reviewed at the NEJL. This entry was posted in General, History of Legal Services, Research on October 14, 2016 by Katharina Hering. This entry was posted in General, History of Legal Services, Research on June 2, 2016 by Katharina Hering. Victor Geminiani reviewed it for the Clearinghouse Review, Vol. 2015, Issue 5, and Alan Houseman wrote a reflection, published in the Georgetown Journal on Poverty Law and Policy, vol. 23, no. 2. This entry was posted in General, History of Legal Services, Research, War on Poverty anniversary on May 18, 2016 by Katharina Hering. This entry was posted in General, History of Legal Services, Research, War on Poverty anniversary on April 29, 2016 by Katharina Hering. Sara Mayeux. Review of Batlan, Felice, Women and Justice for the Poor: A History of Legal Aid, 1863-1945. H-Law, H-Net Reviews. March, 2016. This entry was posted in General, History of Legal Services, Research on March 31, 2016 by Katharina Hering.